Brother of Saint Syra of Troyes. Raised in an Irish monastery, which in the 7th century were great repositories of learning, including the use of healing herbs, a skill studied by Fiacre. His knowledge and holiness caused followers to flock to him, which destroyed the holy isolation he sought. 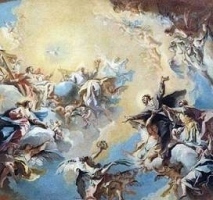 Fleeing to France, he established a hermitage in a cave near a spring, and was given land for his hermitage by Saint Faro of Meaux, who was bishop at the time. Fiacre asked for land for a garden for food and healing herbs. The bishop said Fiacre could have as much land as he could entrench in one day. The next morning Fiacre walked around the perimeter of the land he wanted, dragged his spade behind him. Wherever the spade touched, trees were toppled, bushes uprooted, and the soil was entrenched. A local woman heard of this, and claimed sorcery was involved, but the bishop decided it was a miracle. This garden, miraculously obtained, became a place of pilgrimage for centuries for those seeking healing. 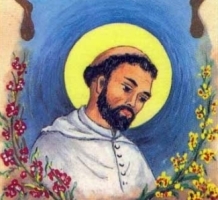 Fiacre had the gift of healing by laying on his hands; blindness, polypus, and fevers are mentioned by the old records as being cured by his touch; he was especially effective against a type of tumour or fistula later known as "le fic de S. Fiacre". Fiacre's connection to cab drivers is because the Hotel de Saint Fiacre in Paris, France rented carriages. People who had no idea who Fiacre was referred to the cabs as Fiacre cabs, and eventually just as fiacres. Those who drove them assumed Fiacre as their patron. Educated at Saint-Paul-Outside-the-Walls abbey, Rome, Italy from age 11. Entered the Cassinese Benedictine monastic noviate in 1896, taking the name Ildefonso. Made his formal monastic confession on 13 November 1900. Ordained on 19 March 1904 in Rome. Novice master of his house from 1908 to 1916. Prior of the abbey from 1916 to 1918. Procurator general of the Congregation of Monte Cassino from 1914 to 1929. Abbot-ordinary of abbey nullius of Saint-Paul-Outside-the-Walls on 6 April 1918. President of the Pontifical Oriental Institute from 7 October 1919 to 4 July 1922, and teacher at several colleges and institutes. Consultor to the Sacred Congregation of Rites in the sections for the Liturgy and for the Causes of Saints. Censor of the Academy of Sacred Liturgy. President of the Commission for Sacred Art Apostolic Visitor to seminaries of Lombardy and Calabria. Appointed Archbishop of Milan on 26 June 1929 by Pope Pius XI. Created cardinal on 15 July 1929. Papal legate to several events and congresses in Europe. Participated in the conclave of 1939. Founded the Institute of Amrosian Chant and Sacred Music and the Ambrosianeum and Didascaleion cultural centres, and wrote for the daily publication L'Italia. There was some controversy during the investigation of his Cause as some claimed he was sympathetic to Fascism. Evidence, however, shows that he denounced Fascism's meddling with the youth organization Catholic Action, refused to participate in ceremonies involving Mussolini, and condemned racist legislation. The cardinal was primarily concerned with the spiritual well-being of his flock, the physical needs of the poor, assistance to newly married couples in order to create strong marriages, and with the administration of the Archdiocese. Born to a working class family. After completing her education at a boarding school in Barcelona, Spain, she joined a group of twelve young women under the direction of Father Juan Bonal, who administered Our Lady of Grace Hospital in Zaragoza, Spain. The small community was dedicated to serving the most helpless: the sick, the mentally ill, abandoned children, and the disabled, and became the Sisters of Charity of Saint Anne. At age of 23 Maria was appointed superior of the group, a position that often put her in conflict with hospital employees. During the Napoleonic wars, she worked in the bombed ruins to save the sick and children. She even ventured into the enemy camp to plead with the French general for help with the sick and wounded. She worked tirelessly for the approval of her small community, and in 1825 they took their first public vows. Victim of slander, she was imprisoned during the Carlist War, but later released. Born to a wealthy and politically connected family. Educated in medicine and philosophy. Noted scholar, musician, composer, music editor, and orator. Professor of medicine at the University of Turin, Italy. Private physician to the ambassador from Savoy to Rome in 1575. There he met Saint Philip Neri and decided to follow his call to the priesthood. Worked with Saint Philip at the Congregation of the Oratory in Naples, Italy. Introduced the use of the written catechism to Saluzzo, Italy, and brought a re-birth of faith and good works in that city. Bishop of Saluzzo in 1596. Reportedly poisoned by a monk that he had chastized. Son of Juan Ventaja and Palmira Milán. Educated at Sacro Monte Granada, and both the Collegio San Giuseppe and Pontifical Gregorian University in Rome, Italy. Priest, ordained in Rome in 1902. Chaplain, then church canon and then professor of moral theology at Sacro Monte Granada; member of the Academic Council at the Central Seminary of Granada. Bishop of Almería, Spain on 1 May 1935. Arrested by the anti-Catholic Popular Front forces in the Spanish Civil War, and executed for the crime of teaching Christianity. One of the Martyrs of Almeria killed during the Spanish Civil War. Son of Juan Medina Garzón and Pilar Olmos Núñez. A prodigy, he graduated at age 13, earned a doctorate in theology at 17, and before age 22 he had doctorates in canon law, philosophy and literature. Priest, ordained on 19 December 1891. Parish priest and prefect of seminarians in Guadix, Spain. Auxiliary bishop of and rector of Sacro Monte at Granada, Spain and titular bishop of Amorium on 14 December 1925. Bishop of Guadix on 2 October 1928. Published several book. Arrested by the anti-Catholic Popular Front forces in the Spanish Civil War, and executed for the crime of teaching Christianity. One of the Martyrs of Almeria killed during the Spanish Civil War. Waterman, and servant of Saint Margaret Ward. He helped Father Richard Watson, a condemned priest, escape by meeting him outside the prison with a boat, then changing clothes with him to lead pursuers off his trail. Condemned to death for aiding a priest, he was offered freedom if he asked the Queen's pardon and promised to go to church; he answered that he had done nothing to offend her Majesty, and it was against his conscience to attend a Protestant church. One of the Forty Martyrs of England and Wales. Franciscan Capuchin friar, making his profession on 3 January 1897. Ordained a priest on 19 December 1903. Missionary to Colombia where he served as superior of several convents. Rector of the Seraphic Seminary of Massamagrell, Spain where he encouraged Eucharastic Adoration and Marian devotion. When the persecutions of the Spanish Civil War began, Father Joaquin made sure that the seminarians were safe, and then went into hiding in Rafelbuñol, Valencia. Arrested and murdered on 30 August 1936 for the crime of being a priest. Martyr. Pious and learned Roman senator and proconsul; member of the noble Fuii family. Studied rhetoric with Saint Jerome. Married to Paulina, one of the daughters of Saint Paula, in 385. Widower in 397, Paulina dying in childbirth. Following Paulina's death, Pammachius devoted his wealth and the rest of his life to study and charity. Cared for sick pilgrims to Rome, Italy working with Saint Fabiola to build a hospital for them, the first in the West, at Porto Romano. Built a church on the property next to his home, and on the site of his home now sits the church of Saint John and Paul in Rome. Friend of Saint Paulinus of Nola. Corresponded with Saint Jerome on matters of faith, and tried unsuccessfully to get Jerome to tone down the language he used when referring to opponents. Spiritual student of Radolfo in Laon, France. He was so moved by a sermon of Saint Norbert of Xanten that he followed Norbert back to his monastery and joined the new Premonstratensians. Noted for his austere, ascetic life. Assigned by Blessed Hugh of Fosse to be prior of the new abbey of Ste-Marie-aux-Boix at Pont-à-Mousson, France. Had the gift of prophecy, and skill as an exorcist. Born to the Welsh nobility. Layman in the apostolic vicariate of England. Imprisoned and executed in the persecutions of Queen Elizabeth I for the crime of helping priests; he had given some wine to Father William Horner. Educated at Rheims and Rome. Ordained at Rome in February 1586. Returned to England as a home missioner in 1586. Arrested in London in 1586 for his faith, and exiled. Undaunted, he returned, and was arrested in 1588 and imprisoned in the Tower of London in June. Convicted down the Old Bailey for the crime of priesthood. Martyr. Educated in Oria, Brindisi, Italy by Eastern hermits and monks. Young imperial courtier in Constantinople, Bishop of Oria in the latter 9th century. Held a synod of bishops in Oria in 881. Served as peace-maker between the Byzantines and the Lombards, and had both Latin and Greek churches in his diocese. Served as diplomat to Constantinople for Pope Stephen V. His diplomatic work led to the donation of the relics of Saint Cistanto and Daria from the Pope, and of Saint Barsanuphius from Palestine. Monk in Calabria, Italy. Manuscript copyist. Known for his severely ascetic life style, and for receiving visions of heaven and hell. Abbot of San Mercurius Abbey, a monastery that was destroyed by invading Saracens when Fantinus was an old man. Bishop in England. Romansleigh, England is named for him. Benedictine monk at the Abbey of San Esteban in , Italy. Hermit near Cairo, Egypt, and then on Mount Sinai; even the Islamic authorities recognized that he was a holy man, and left him alone. Abbot of Lucedio Abbey near Trino, Italy at the request of Bishop Peter of Vercelli, Italy. Son of Edward Shelley of Warminghurst, Sussex and Joan of Penshurst, Kent. Lifelong layman. Arrested in April 1584 for possessing the banned book My Lord Leicester's Commonwealth, for assisting Blessed William Dean, and for harbouring priests. Martyr. Priest in Rome. Ordered to offer sacrifice to the pagan gods, he refused and prayed instead; the idols shattered. Arrested, tortured, and martyred. 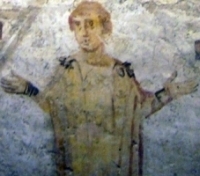 As Saint Felix of Rome was being dragged to his martyrdom, Adauctus, a bystander, was moved to proclaim his own faith. Martyr. Shropshire gentleman. Educated at Broadgates Hall, Oxford, England. Condemned to death for sheltering priests. Martyr. Frankish nobleman and courtier. Monk at Luxeuil Abbey. Spiritual student of Saint Columbanus. Missionary to Bavaria, Germany. Abbot of Rebais monastery near Paris, France. Young woman in Rome, Italy who made personal vows, dedicating herself to God. Martyred with three companions whose names have not come down to us. Mercedarian friar in the convent of San Tommaso in Tortosa, Spain. Theologian. Abbot of his house. Married to Saint Boniface of Hadrumetum. Mother of the Twelve Holy Brothers. Martyred in the persecutions of Maximian Herculeaus. Evangelist who preached to peasants in the Tivoli, Anagni and Subiaco areas of Italy. Hermit near Burgos, Old Castile, Spain. Martyred by Saracens. Fifth-century spiritual student of Saint Patrick. A group of 60 Christians martyred for destroying a statue of Hermes.